How many actresses today can boast of having made as many good pictures as Janet Leigh? And we mean really good pictures, like Psycho, Touch Of Evil, Scaramouche, The Manchurian Candidate, The Naked Spur --- those are just the acknowledged classics --- but we’ve always been partial to Act Of Violence, Holiday Affair (love that Bob! ), Prince Valiant, Rogue Cop (Bad Bob! ), The Vikings. Heck, she’s even in one of those fake U.N.C.L.E. features, The Spy In The Green Hat! Tell you what, Universal, if you’ll release The Perfect Furlough on DVD, we’ll buy it. Promise! Janet was by all accounts a nice person. I wrote her a fan letter once, telling her how much I enjoyed Holiday Affair, and got a nice autographed still in return. That’s pretty generous for a star in this day and age when they all want you to S.A.S.E., or better yet, lay $25.00 give or take on them for a signature. Thing is, I didn’t even ask Janet for hers. She just sent it. Good for you, Janet. We also loved that tribute to Norma Shearer she did for TCM. Anyone who pays tribute to Norma is aces in our book. Besides, Norma discovered Janet, out on a ski slope, I think. 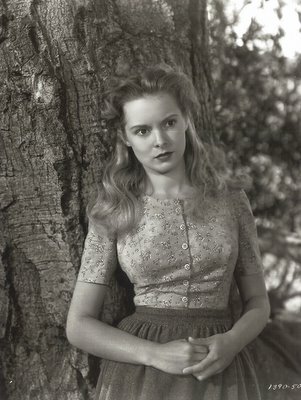 The portrait pose is from Janet’s very first movie, The Romance Of Rosy Ridge. She was nineteen when she made it. We suspect Janet knew a lot more inside dope on Vegas and Rat Pack hijinx than she ever revealed. After all, she and Tony hung out lots with that mob, and she worked with Frank and Dean several times. There's a lot of scoop and mysteries we still wonder about. Tony wrote a fine autobio, but we think he’s still holding back. C’mon Tony, tell us all before it’s too late! Check out the dashing "Pancho" with Janet in the fetching backstage-at-Metro pose. That’s the amazing Gilbert Roland, and he’s taking the sun here during a break from The Bad and The Beautiful in 1952. Gil was truly the man. His career went back to the silents, and for a while, he was Clara Bow’s off-screen paramour, that is, when he wasn’t making time with Norma Talmadge. Married to Constance Bennett during the forties, Roland was an ageless wonder. To our everlasting awe, he was still doing action parts and bedding Italian starlets onscreen in a brace of spaghetti westerns in the late sixties! Gil had a long life, too. Made it to 88. Bravo, Gil. We wish we had half your stamina.